Jaws is one of my all time favourite films. A true classic – I remember watching it as a small child from behind a cushion and being scared to go in the sea at a range of British seaside resorts for many years. About 10 years ago I learned to scuba dive, and my world changed. I got to experience the sensation of floating in underwater space and with it the opportunity to see so many amazing things. I also learnt that sharks are pretty cool. Sharks are top of the underwater food chain and central to maintaining the balance of our oceans. Two-thirds of the world’s surface is water and over 80% of life on earth lives in the ocean. The health of the oceans are vital to the health of the earth itself. If the sharks go, the balance will shift and I can’t even begin to imagine what that will mean for us. This shark defence training film from 1964 is for real. Hopefully we are a bit wiser about sharks now but they still get a bad press. They don’t exist to prey on holiday makers on Florida’s beaches, they are wild animals and must be treated with respect and caution. Studies show that sharks are picky eaters and prefer to eat things that are smaller than them, if they really wanted to make a career out of eating humans they would. Shark attacks are relatively rare, and often because people have put themselves in a vulnerable situation. Sharks kill 5 people each year, elephants and tigers kill approx 100, executions take 2,400 lives, illegal drugs 22,000, road accidents 1,200,000 and starvation 8,000,000. In the grand scheme of life, sharks are not the bad guys. I recently watched Shark Water; a gritty documentary about the shark fin trade. It bought me to tears. Sharks are endangered because they are killed for their fins, which are highly valued in Asia for shark fin soup. They are believed to have health giving properties, and are regarded as a symbol of wealth and served as a sign of respect. A large fin can sell for over $10,000 in China. The way that the sharks are caught is barbaric. They are hooked on long lines, which are miles and miles of indiscriminate trap-lines that catch everything in their path. The animals that are caught that have no commercial value are left to die long and slow deaths as they tangle themselves in the line in their desperate attempts to escape. This form of fishing is desecrating the oceans. 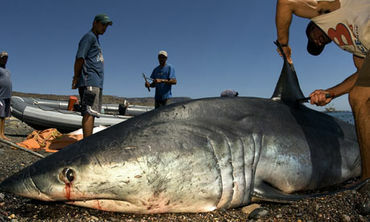 The shark fins are cut off and the sharks thrown back into the sea alive to bleed to death. Part of the problem is that 64 percent of our ocean isn’t even protected by any national law at all. In a recent TED talk Kristina Gjerde studies the laws of the high seas and tells how she is working with other lawyers to protect areas from trawling and trash-dumping. 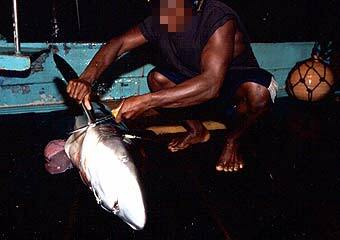 Over 1.5 million sharks are killed each week. I don’t know how long the oceans can sustain this. But it’s not just about saving sharks ultimately it’s about saving ourselves. This blog is about making a difference; all social change comes from the passion and intervention of individuals or small groups of individuals. That’s you and me. This entry was posted in Life and Death, scuba diving, travel and tagged asia, attack, diving, ecosystem, fins, food chain, jaws, kill, Kristina Gjerde, life, long lining, marine conservationoceans, protect, rob stewart, scuba diving, shark fin soup, shark water, sharks, TED talks, trawling. Bookmark the permalink.